Tripp Lite's U215-004-R 4-port USB 2.0 Peripheral Sharing Switch allows you to connect up to four computers to one USB peripheral such as a printer, scanner, high-capacity hard drive and many others. Ideal for and small office computers. It not only saves space, but also eliminates the cost of buying separate USB devices for every computer. Plus, it simplifies cable management in the office area. Quickly switch between computers using keyboard hot-keys, mouse, or manually. Plug-and-play functionality makes installation a breeze. Supports both high-speed USB 2.0 peripherals with transfer rates up to 480 Mbps. Backward compatible to legacy USB 1.1 devices. Compatible with most major operating systems. Icon task bar indicates switch status at a glance, and active LEDs indicate which computer is currently using the peripheral. No separate AC adapter required. Power is drawn through the USB cables. Gain more functionality from home and office computer peripherals by sharing them with multiple computers. 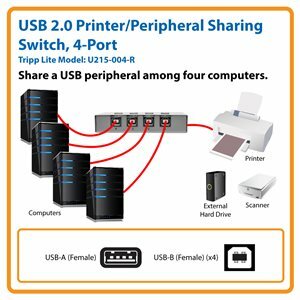 Tripp Lite's U215-004-R USB 2.0 Peripheral Sharing Switch allows you to connect up to four computers to a single USB peripheral, such as a printer, scanner or high-capacity hard drive. This eliminates the need for peripherals for each computer, which saves money, time and space in a multi-computer installation. The U215-004-R is self-powered and requires minimal setup beyond loading the included software. Connect the USB-A port to your peripheral, and connect the four numbered USB-B ports to computers. Switch between computers with one touch using the switch push-buttons, your mouse or a keyboard hot-key command. The LEDs indicate which computer is currently using the peripheral. The U215-004-R supports high-speed USB 2.0 peripherals with transfer rates up to 480 Mbps. It's backward compatible with USB 1.1 devices, which means you can keep using older peripherals while getting maximum high-speed performance from new devices. The U215-004-R supports most major operating systems, including Mac OS X® and Windows® (up to 8.1; 32- and 64-bit versions), to provide flexibility for your applications. The U215-004-R comes with a three-year warranty. It's manufactured in compliance with strict RoHS specifications, reflecting Tripp Lite’s commitment to environmental responsibility.